Once traveling 2.78 miles between Ybor City and Seminole Heights in Tampa, State Road 585 ran north from U.S. 41 Business / Florida 60 (Adamo Drive) to U.S. 41 & 92 (Hillsborough Avenue). The urban route used to split between a couplet of 21st Street (south) and 22nd Street (north) through Ybor City before combining solely along 22nd Street north of 21st Avenue to Hillsborough Avenue. Completion of the I-4 Connector between Interstate 4 and the Selmon Expressway in January 2014 resulted in the eventual turning back of State Road 585 which occurred by 2017. Since the opening of the Connector, truck traffic is now prohibited from using the couplet of 21st and 22nd Streets through Ybor City. In 2016 FDOT repaved the routing prior to the switch. A short segment of County Road 585 once followed Rowlett Park Drive between Sligh Avenue and Waters Avenue at the Sulphur Springs neighborhood. This stretch of Rowlett Park Drive was planned as part of a realignment for U.S. 41 from Nebraska Avenue southeast to 40th Street. 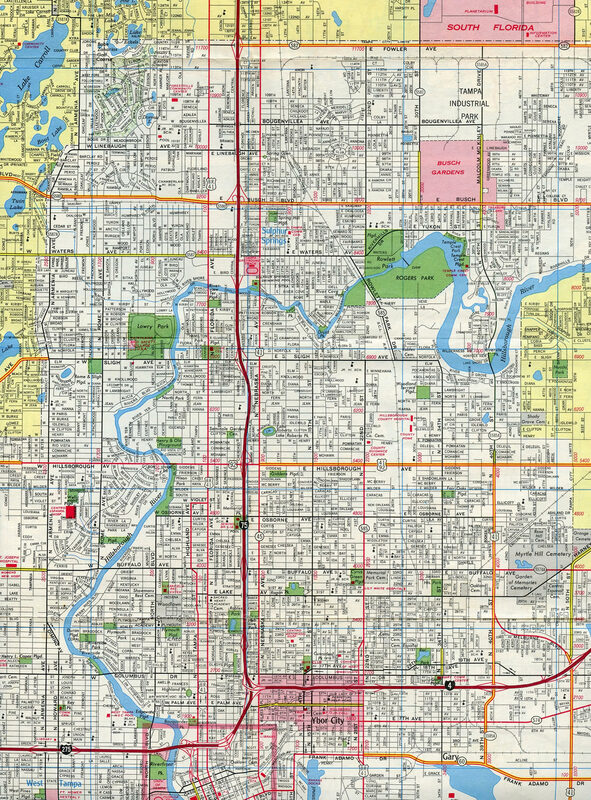 This 1975 map of Tampa shows the extension of Florida 585 along Rowlett Park Drive. Additionally Florida Secondary 585A was posted along North 39th and 40th Streets, what is now Florida 569, and North 40th Street beyond the turn of U.S. 41 onto U.S. 92. Malcolm McKinley Drive between Florida 580 and 582 is still County Road 585A. Three blocks north of the SR 585 beginning in Ybor City is the traffic light with East 4th Avenue. Photo taken 03/15/14. East 7th Avenue bisects the Ybor City commercial district west from 22nd Street. The street doubles as County Road 574, though signs for the route are seldom posted. Photo taken 04/15/15. Just beyond a CSX Railroad crossing is the traffic light with East 7th Avenue. County Road 574 stretches 9.25 miles east from Nebraska Avenue (SR 45) in Tampa to SR 574 (Dr. Martin Luther King, Jr. Boulevard) at Mango. Photos taken 04/15/15. 8th Avenue follows west from 22nd Street to the Ybor City State Museum and Nuccio Parkway. Photo taken 03/15/14. Palm Avenue (10th Avenue) provides a wide boulevard west from 22nd Street to Hillsborough Community College Ybor Campus and Nebraska Avenue (SR 45). Photo taken 03/15/14. 22nd Street north meets Interstate 4 at a split-diamond interchange in three blocks. Photo taken 03/15/14. One block of 13th Avenue connects the eastbound off-ramp of I-4 to the on-ramp for 21st and 22nd Streets. 14th Avenue provides the westbound movement between the couplet. Photo taken 03/15/14. Interstate 4 connects Tampa and Ybor City with Plant City, Lakeland, and Orlando to the east. The freeway through Tampa was rebuilt in the mid-2000s to incorporate a wider right of way and new overpasses and ramp configurations. Photo taken 03/15/14. Just west from 21st and 22nd Streets, Interstate 4 ends at the Downtown Interchange with Interstate 275. Photo taken 03/15/14. Columbus Drive parallels I-4 just to the north as a through route east from Tampa Heights to U.S. 41 (50th Street). Photo taken 03/15/14. 17th Avenue provides the westbound movement of Columbus Drive through Ybor City. Photo taken 03/15/14. The one-way couplet of Florida 585 combines at a roundabout with East 23rd Avenue west and East 22nd Avenue east. Photo taken 03/15/14. 22nd Street stems north from the roundabout with two-way traffic. Photo taken 03/15/14. East 26th Avenue intersects North 22nd Street by the College Hill community. Photo taken 03/15/14. Lake Avenue joins 22nd Street with College Hill to the east and a middle school to the west en route to U.S. 41 Business (Florida Avenue). Photo taken 03/15/14. Approaching Florida 574 along North 22nd Street north. SR 574 follows all of MLK Boulevard from U.S. 92 (Dale Mabry Highway) east to Plant City. A planter median was added to 22nd Street by 2011. Photo taken 03/15/14. Florida 574 (Dr. Martin Luther King, Jr. Boulevard) heads west to meet I-275 (Exit 46B) and West Tampa. East from 22nd Street, the state road lines the north side of College Hill to Grant Park, I-4 (Exit 5) and Orient Park. Photo taken 03/15/14. Osborne Avenue and 22nd Street intersect at the South Seminole Heights neighborhood. Photo taken 03/15/14. The final reassurance marker for Florida 585 north was posted after Osborne Avenue. Photo taken 03/15/14. Wilder Avenue stems east from North 19th Street to Middleton High School. Photo taken 03/15/14. Florida 585 concludes at U.S. 41 & 92 (Hillsborough Avenue) ahead of Seminole Heights in Tampa. U.S. 41 & 92 share pavement east to 40th Street and west to Nebraska Avenue. 22nd Street continues north to the Hillsborough River. Photo taken 03/15/14. 22nd Street continues north one half mile to Hanna Avenue within Seminole Heights of Tampa. The rare Eagle brand signal pictured here was replaced along with the other signals by 2011. Photo taken 03/19/06. The first shield for Florida 585 was posted just south of Hillsborough Avenue (U.S. 41 & 92). It was removed when a bus turnout was installed here by April 2015. Photo taken 01/30/15. A traffic light at Wilder Avenue governs the movements between North 22nd Street and adjacent Middleton Magnet High School. Photo taken 01/30/15. Osborne Avenue lines the south side of the high school east to U.S. 41 (North 40th Street) and west through South Seminole Heights. Photo taken 01/30/15. A reassurance marker for Florida 585 stands along North 22nd Street, south of Osborne Avenue. Photo taken 01/30/15. A half mile south of Osborne Avenue is the junction with Florida 574 (Dr. Martin Luther King, Jr. Boulevard) on North 22nd Street. Florida 574 runs east through the College Hill community to Grant Park and west to I-275 and Riverside Heights. Photo taken 01/30/15. A 23.04-mile route, Florida 574 (Dr. Martin Luther King, Jr. Boulevard) heads west to U.S. 92 (Dale Mabry Highway) by Raymond James Stadium in Tampa and east to U.S. 92 again in Plant City. The state road comprises a busy through route in Tampa. Photo taken 01/30/15. SR 585 reassurance marker posted south of SR 574 along side Cyrus Green Park as North 22nd Street enters the College Hill community. Photo taken 01/30/15. Lake Avenue ventures west to Belmont Estates and east to become SR 583 beyond the Tampa city line. Photo taken 01/30/15. Continuing south toward Ybor City, east-west avenues become numbered to SR 60 (Adamo Drive). East 26th Avenue intersects SR 585 east of Orange Grove Middle School. Photo taken 01/30/15. A roundabout was constructed in 2013 at the split of SR 585 into the one-way couplet of North 21st and 22nd Streets through Ybor City. East 23rd and 22nd Avenues tie into the circle. Photo taken 01/30/15. A monument to East Tampa resides within the roundabout at the 21st Street split of Florida 585 south. Photo taken 01/30/15. The remaining 1.08 miles of SR 585 south travels North 21st Street to SR 60 (Adamo Drive). Photo taken 01/30/15. East 17th Avenue and Columbus Drive form a one-way couplet carrying through east-west traffic through northern reaches of Ybor City. Photo taken 01/30/15. A split diamond interchange joins Interstate 4 with 21st and 22nd Streets at Ybor City. The westbound on-ramp joins the final 0.75 miles of the route to the Downtown Interchange with I-275. Photo taken 03/15/14. 14th Avenue extends west from the I-4 off-ramp to YBor City to 21st Street (former SR 585 south) and the return ramp for Downtown Tampa. Photos taken 07/10/11. Drivers bound for I-4 east from 21st Street south follow one block of East 13th Avenue to the freeway on-ramp. Interstate 4 comprises a busy commuter route east to Mango and Seffner. Photo taken 03/15/14. The final shield assembly for Florida 585 lined 21st Street south between 12th and 11th Avenues. Photo taken 03/15/14. Palm Avenue (East 10th Avenue) comprises a four-lane boulevard west from North 22nd Street to the Ybor City State Museum, and the Ybor Campus of Hillsborough Community College. Photo taken 03/15/14. Second photo taken 07/06/13. North 21st Street south at East 8th Avenue. Photo taken 03/15/14. East 7th Avenue (County Road 574) runs west through the heart of the Ybor City business district from 22nd Street. Photo taken 03/15/14. A set of signals govern the movements between North 21st Street south at East 4th Avenue. Photo taken 03/15/14. Florida 585 ends opposite the U.S. 41 Business southward turn from Florida 60 (Adamo Drive) onto South 20th Street. Adamo Drive carries SR 60 east from Channelside Drive toward Brandon. Photo taken 03/15/14. Interests to Port Tampa Bay are directed southward on U.S. 41 Business. A ferry terminal resides there. Florida 60 west and U.S. 41 Business north head west then south to toward the Cruise Terminals at Channelside before entering Downtown Tampa. Photo taken 03/15/14. Sligh Avenue west at Rowlett Park Drive near the Seminole Heights community. Rowlett Park Drive was formerly a part of a 1.1-mile segment of unsigned CR 585 between Sligh Avenue and Waters Avenue at the Sulphur Springs neighborhood. Photo taken 03/19/06. A look at the Rowlett Park Drive bridge over the Hillsborough River. Photo taken 03/19/06. Rowlett Park Drive (old CR 585) intersects Mulberry Drive and North 22nd Street opposite the Hillsborough River. A CSX Railroad line parallels Rowlett Park Drive throughout its routing. Photo taken 03/19/06. A CSX Railroad spans the Hillsborough River parallel to Rowlett Park Drive along this truss bridge. Photos taken 03/19/06. 03/19/06 by AARoads and Justin Cozart.